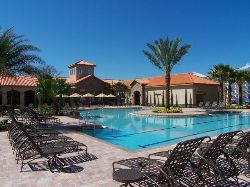 Vista Cay is a stunning 1500 acre Tuscan themed vacation resort located right in the heart of Orlando's International Drive area, adjacent to the Shingle Creek Golf Resort and just a few minutes walk from the Orlando Convention Center. The combination of the outstanding quality and value of Vista Cay's accommodation and amenities plus an almost unrivalled location putting guests just a few minutes from Seaworld, Discovery Cove, Universal Orlando and the vast selection of shops, restaurants and attractions on International Drive is making Vista Cay Resort the number one vacation resort with UK holidaymakers. 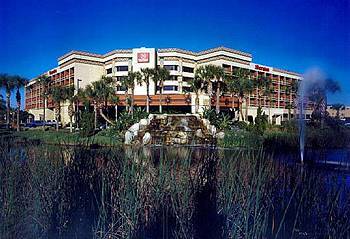 The resort offers a more upmarket and refined experience than given by our alternatives in Kissimmee and Davenport and will appeal to both holidaymakers and the business traveller. On site amenities are exceptional plus guests also have the option of using of the public facilities at the adjacent Shingle Creek Golf Resort (golf, swimming pool, spa) for a small fee. The central point of this exclusive resort is a 10,000 sq foot state-of-the-art clubhouse with movie theatre, games room, fitness centre, internet library, meeting rooms, a large resort style swimming pool and jacuzzi with multi-level sun deck, kids playground and sports court. 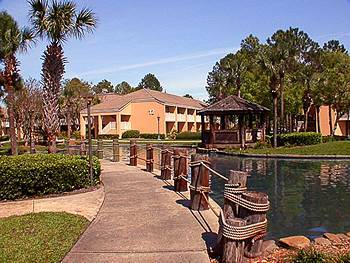 Vista Cay is the first Orlando resort community zoned for short-term rental. 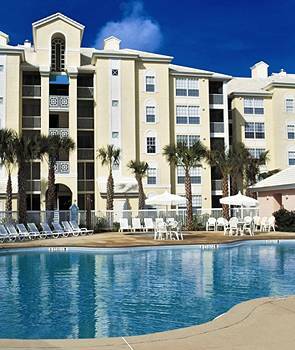 This means you get great resort amenities, exceptional vacation home quality, value and comfort, and a fantastic Orlando address. Set to be the most popular self catering development of 2007, the excellent location, superior service and onsite amenities mean that demand will far outstrip supply. The resort offers a selection of condominiums and three storey townhomes. The single level condos, situated in a number of four storey buildings with plush entrances, interior corridors and elevators are absolutely immaculate and offer probably the highest standard of decor and furnishings we have seen in the Orlando short term rental market. All condos are built to an open plan design with a central living room with cable TV and VCR or DVD Player and games station, a dining area and a huge fully equipped gourmet kitchen. There are two good sized bedrooms, the master bedroom features a king sized bed, TV, hairdryer and oversized ensuite bathroom while the second bedroom will have either one double or two single beds with its own TV and has use of a large family bathroom. Every condo has it's own private balcony or terrace. All townhouses are built around the same basic design and style. On the ground floor is a single car garage, private hallway entrance, spacious bedroom with small bathroom and outside patio and stairway leading to the first floor and the main living space. The first floor is an open plan design with a central living room with cable TV and VCR or DVD Player, CD Player and games station, a dining area and a huge fully equipped gourmet kitchen. On the second floor are two generously sized bedrooms, the master bedroom features a king sized bed, TV, hairdryer and oversized ensuite bathroom while the second bedroom will have either one double or two single beds plus it's own TV and family bathroom.